Here's Tebow mic'd up during the Bears game. And check out this link--the last 4 minutes of the game. Tebow was singing church hymns in warmups--off key of course. So remember Hugh Douglas and his errant prediction--- and having to go to church after a Bronco win? Tebow during the presser said "Douglas better get out his Sunday best...and I hope he sings praise and worship too." Hugh watched the game, where Tebow won with ESPN's with Michael A Smith. Tebow's "praise and worship" song that he was humming before the Bears game is here-- sung by Michael W Smith. So once again, with Tebow, you have that coincidental connection that drives the critics crazy, and make his followers believe. But the real secret to Tebow's success is hard work. The temptation is to look at Tebow’s serene smiles in news conferences, watch him shrug shyly at questions about his abilities, listen to him talk about Jesus and think he is a man who plays football simply to spread the word of the Bible. The image is of a marginally skilled player who believes the Lord will slice holes in the defense or find a way to get a receiver open downfield. Want a reason the Broncos are in first place in the AFC West with what amounts to a two-game lead over the Oakland Raiders? It is Tebow’s obsessive preparation. The hour doesn’t matter. 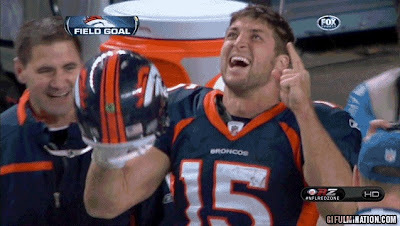 It could be 9 p.m., maybe 10, but at some point every night the phone of Broncos quarterbacks coach Adam Gase will ring and Tim Tebow will be on the line. “I’ve been watching film,” Tebow will say. Then a string of questions: What happens if a defensive player moves a certain way? How should he go? And what about the receivers? Are there other options? Quietly, Tebow has dazzled the Broncos coaches with his deep understanding of complex offenses. When he showed up to the team’s suite for his interview with the staff at last year’s combine, he immediately rattled off the principles of his offense at Florida. But then he launched into Norv Turner’s digit system as well as the Patriots’ offense, which the Broncos were also using. The coaches were stunned. So if you can criticize his work ethic, criticize him, because he belives in God. So does that mean then, that the critics and haters are are being pawned by Tebow's Awesome God? Autocarbazar.com is one of the best used cars providing company. Here you will get the best used cars at very affordable price.